Healthy Loser Gal: Doing the happy dance! 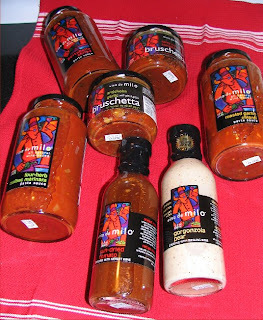 Don't these pasta sauces, bruschetta and salad dressings look good?! And they ARE good! Made with all natural locally-grown Ohio ingredients and a touch of wine... Vino de Milo products are oh-so-delicious! Follow these guys on Twitter @VinoDeMilo or on Facebook, too, as they will often post really great recipes! It IS exciting winning things. It's exciting getting what you have won, too. chuckle. How's those Roman Meal coupons goin? Yum! I Love pasta sauce! Congrats on the prize! Congrats on the prize! You have been a good marketing arm for them! I am having an excellent weekend with food, the HLGWOW!! is a good thing. Hope you are having a nice weekend!